'THE HOUSE ON PINE STREET' is a sinister psychological story following the 7 month pregnant couple of Jennifer Branagan (Emily Goss) and her husband Luke as they move from Chicago to Jennifer's hometown in Kansas after she suffers a mental breakdown. While on the surface to everyone else everything seems fine with the couple, things start to take a turn for the worse as Jennifer starts to have experiences in their new home. Things move on their own, loud noises throughout the house all lead her to believe the house is haunted. Is it this or she losing her sanity? It is hard to a find a fault with this film as it straddles the line between drama and psychological horror. The casting for the film itself is great especially the over bearing mother Meredith played by Cathy Barnett who should really get more roles and Emily Goss. Directors Aaron and Austin Keeling have created a thrilling film that will take you on a turbulent ride through Jennifer's pregnancy and her own ghostly experiences. The running time is close to the 2 hour mark but you will be drawn in so much by the story telling that this will go by fairly quickly. 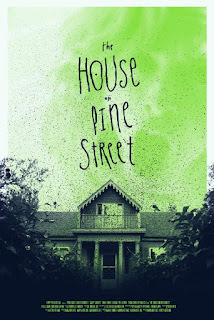 Beautifully shot throughout it is not surprising that 'THE HOUSE ON PINE STREET' has got many lovers already.